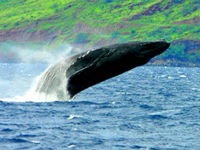 Maui is one of the most important habitats worldwide for the magnificent Humpback Whale. 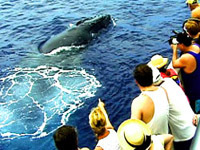 Join us on this incredible adventure which offers you the amazing opportunity to see Humpback Whales during their annual migration to Hawaii, truly an experience you will remember forever. Our power catamaran is jet-driven with no propellers, which makes it ideal for getting up close with these majestic creatures. With a maximum of 30 passengers per tour, we can guarantee you will avoid the crowds typically associated with cruise ship organized tours. 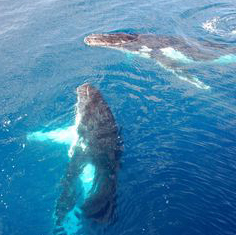 Why are the Humpbacks in Maui? 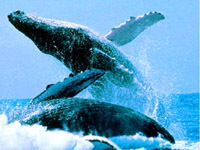 Every year, approximately two-thirds of North Pacific humpback whales, estimates range from 4,000 to 10,000 whales, migrate to Hawaii's warm waters to mate, and to bear and nurse their calves. 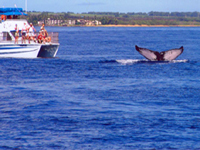 Because Maui has deeper waters than the other Hawaiian Islands, this is the ideal environment for the Humpback Whales. These amazing giants cover nearly 3,000 miles of open ocean in less than two months time arriving in Hawaii around December 15 and staying until around April 15. On board, we have an expert Marine Naturalist to explain the Humpbacks habits and instincts as well as to answer any questions you may have and with our state of the art Hydrophone you to listen to the whales song live through a marine speaker system. 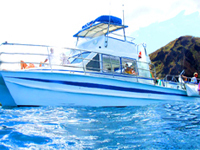 Our Whale Watching Expedition is recommended to everyone as our catamaran offers a calm and relaxing tour while you search for these impressive gentle giants. This highly exclusive Catamaran has limited capacity so please book early to insure your seats on this incredible adventure! !